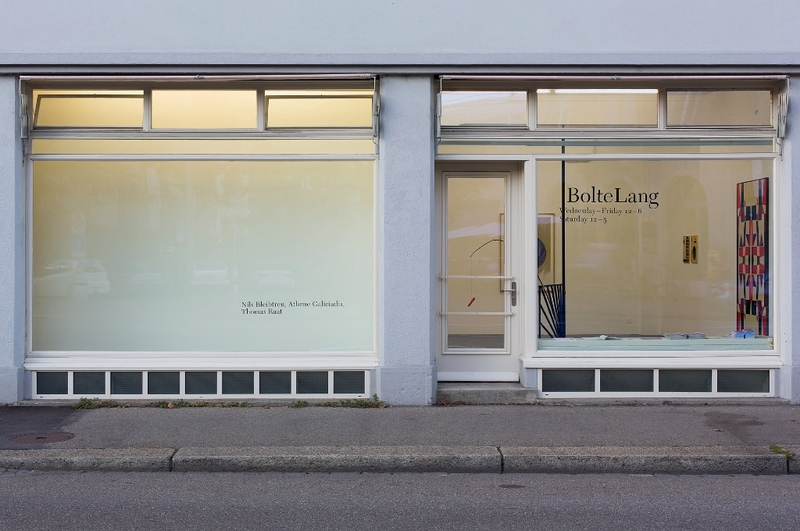 Following Stories being told, 2011 and Jonathan Binet, Lydia Gifford and David Ostrowski, 2012 this is the third group show at BolteLang to focus on a specific movement in contemporary painting. Where the lasts shows looked at figurative and installative painting, this exhibition brings together three artists whose interest lies in depicting the undefined. They base their work on an invisible system, a structure that offers a vague order, whilst leaving space for questions and personal associations. All three artists take much of their inspiration from early 20th century painting by looking at Anthroposophy, Constructivist and Concrete art – movements where shapes, geometry and colour were used to build up visual systems to explain the bigger mysteries of the universe. Science, politics, spiritualism, religion and philosophy can all be found in the seemingly formal works of these three painters. Although Nils Bleibtreu, Athene Galiciadis and Thomas Raat all work with various media, this exhibition will focus predominantlz on their paintings and drawings. Nils Bleibtreu (b. 1987, Germany) studies at the Kunstakademie Düsseldorf under the artist Tal R. Being at the very beginning of his career, Flowers on Gold, the works shown at BolteLang, are an important milestone. They are the result of an ongoing involvement with painting and also the artist’s first series that experiment with gold foil, lending the stringently composed images an almost holistic aura. This will be Athene Galiciadis’ (b. 1978, Switzerland) second group show at BolteLang. A one-month residency at the gallery during the summer of 2012, together with Claudia Comte and Melodie Mousset, led to the exhibition Trouble Rainbow III. Galiciadis looks back on an extensive list of exhibitions both in Switzerland and abroad. Amongst others her work was last seen at Kunsthaus Aarau for the occasion of the overview of the Swiss art scene La Jeunesse est un art. Visions and dreams direct the work of the Zurich based artist who manages to translate these into her both idiosyncratic and accessible language. Her work is strongly influenced by female pioneers of Modernism such as the Swedish painter Hilma af Klint and the Swiss healer Emma Kunz. For his first exhibition in Switzerland, Thomas Raat (b. 1979, Holland) will show works from his newest series following a two-year residency at the Rijksakademie in Amsterdam. He is fascinated by what he calls ‘slipstream’ modernism, meaning all those elements that were created in the shadow of modernism, unnoticed by the masses, the moments when radical turns conventional. He therefore reinterprets and mirrors existing concepts of the 1950s .The applied technique – he cuts wood boards with a sharp piece of metal and then fills the lines with ink, he then continues to wash the boards and fills in the black lines in an almost painting by numbers style – reflects African art techniques, another important reference for the artist.